Early intervention is critical for children who have developmental delays. 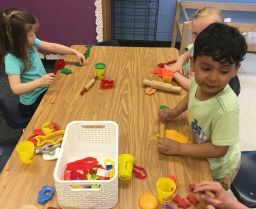 The Shawnee Mission School District provides early childhood special education services for children ages 3, 4, and 5 who meet the eligibility requirements for special education. The school staff and parents work together to determine how to best meet a child's needs. Shawnee Mission early childhood special education staff delivers services for children 3-5 years of age in early childhood special education classrooms located at the Shawnee Mission Early Childhood Education Center and in district elementary schools where there are early childhood programs. Children 2 years 9 months to 5 years of age may also receive special education services for speech and language, occupational, or physical therapy in their neighborhood school. Eligibility for services is determined through screening and evaluation for special education eligibility. If you have a concern about your child's development, contact the Shawnee Mission Early Childhood Education Center at 913.993.2600.